The paintings that are hung on these virtual walls, range from completed work, to works-in-progress. The process is a bit like fly fishing, as I work to push the paint and composition toward an abstract direction - only to reel it back in again, to find the sweet spot for detail and clarity. The sunset light on the cliffs, is quite stunning. The challenge for me, has been to interpret this in terms of color palette, that conveys what I see. The setting sun, throws this extraordinary melon color into the mix. The trick has been, to have my painting "ready" to lay in these color notes, as the sun gets low in the sky. One has to work quickly. As the sun sets, I become aware of working against the clock. 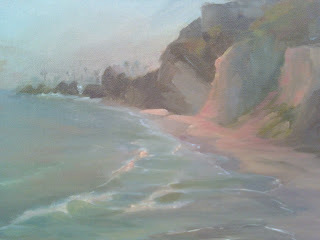 I know that if I paint too slowly, the water becomes a dull green, and the cliffs disappear into shadow. Will continue to work on this color palette. We like to quote Paul (all 'round great guy and cattle whisperer): "Every day is like campin". Unless otherwise noted-all text and image content on this site is Copyright (C) M. Sonoqui Gillette. Powered by Blogger.